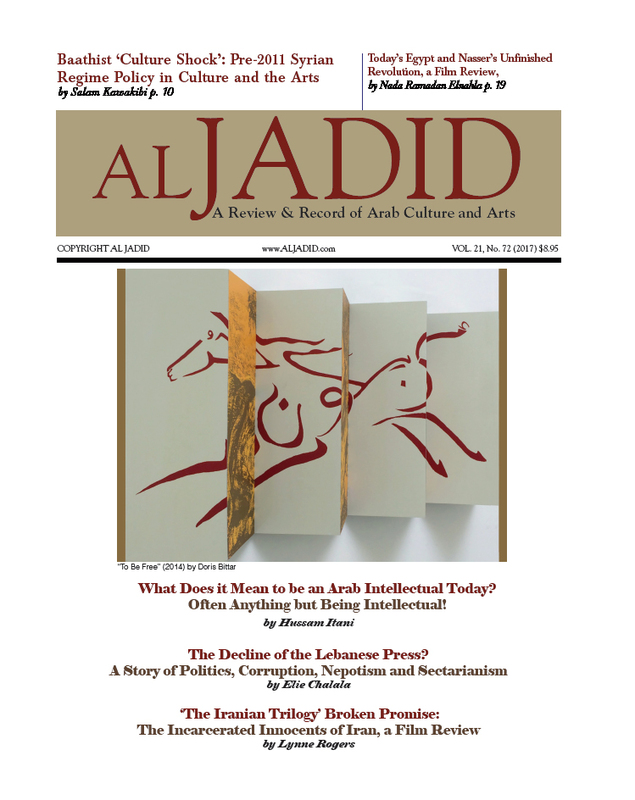 Al Jadid is just out (Vol. 19, No. 68). 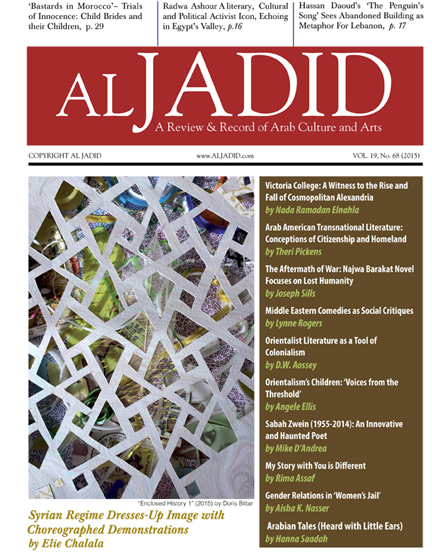 The cover (“Encoded History 1” 2015) by Doris Bittar. 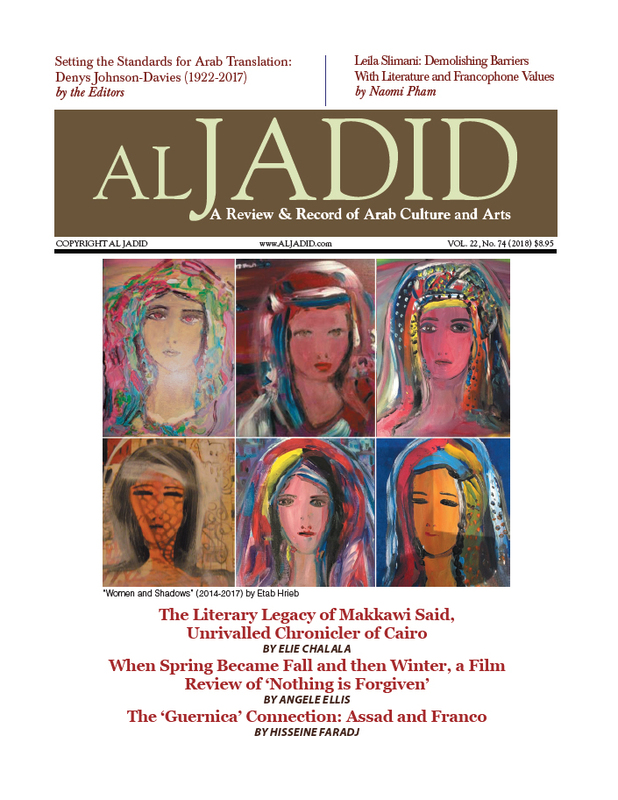 Al Jadid is a Review & Record of Arab Culture and Arts (www.aljadid.com). 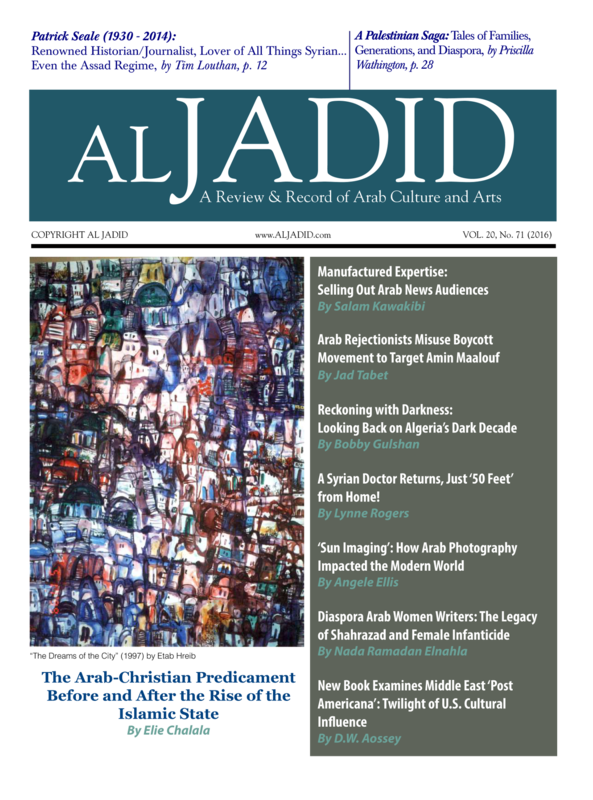 As usual, the new issue is rich with essays and features, book, film and TV reviews, fiction, poetry, and a substantive editor's notebook. 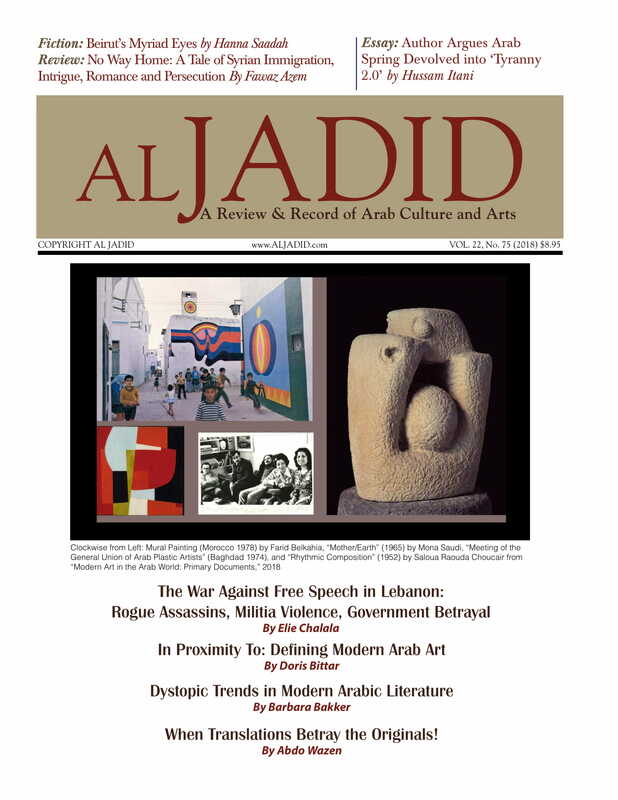 ESSAYS AND FEATURES: ‘My Story With You is Different’ by Rima Assaf; ‘Sabah Zwein (1955-2014): An Innovative And Haunted Poet’ by Mike D’Andrea; ‘Radwa Ashour (1946-2014): A Literary, Cultural And Political Activist Icon, Echoing in Egypt’s Valley’ by Nada Ramadan Elnahla; ‘Sabah: The Cutrain Descends Upon a Great Lebanese Singer & Cultural Icon’ by Sami Asmar; ‘Syrian Regime Dresses-Up Image with Choreographed Demonstrations' by Elie Chalala; ‘Novelist Salwa Bakr Dares to Say it Aloud on Egyptian Revolution’s Successes and Failures’ by Elie Chalala. 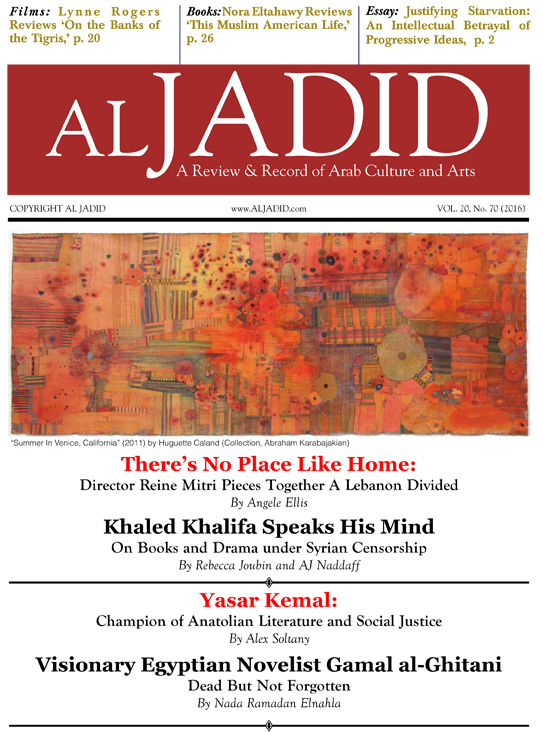 BOOKS REVIEWED: ‘The Moor’s Account’ by Laila Lalami, reviewed by Lynne Rogers; ‘The Penguin’s Song’ by Hassan Daoud, reviewed by Lynne Rogers; ‘Contemporary Arab American Literature: Transnational Reconfigurations of Citizenship And Belonging’ by Carol Fadda-Conrey, reviewed by Theri Pickens; ‘Oh, Salaam!’ by Najwa Barakat reviewed by Joseph Sills; ‘Other Lives’ by Iman Humaydan, reviewed by D.W. Aossey; ‘Contemporary Arab Photography, Video And Mixed Media Art: View From Inside’ by Karin Adrian von Roques, Samer Mohdad, Claude W. Sui, & Wendy Watriss, reviewed by Rebecca Joubin; ‘Diaspo/Renga’ by Marilyn Hacker and Deema Shehabi, reviewed by Miled Faiza; ‘From A Nation Torn: Decolonizing Art And Representation In France, 1945-1962’ by Hannah Feldman, reviewed by D.W. Aossey; ‘Afghanistan—A Distant War’ by Robert Nickelsberg, reviewed by Rebecca Joubin; ‘Victoria College: The Making Of Royalty And Celebrities’ by Dalia Assem, reviewed by Nada Ramadan Elnahla; ‘Infidel Kings And Unholy Warriors,’ by Brian A. Catlos, reviewed by Bobby Gulshan; ‘Sherazade’ by Leila Sebbar, reviewed by D.W. Aossey; ‘Leg Over Leg, Volume One & Volume Two’ by Ahmad Faris Al-Shidyaq, reviewed by Lynne Rogers; ‘A Sleepless Eye: Aphorisms From The Sahara’ by Ibrahim al-Koni, reviewed by Angele Ellis; ‘Charisma’ by Hala Kawtharani, reviewed by Rula Jurdi; ‘Humor In Middle Eastern Cinema,’ by Gayatri Devi and Najat Rahman, reviewed by Lynne Rogers; ‘Democratic Desert: The War in Syria’ by Robert King, reviewed by D.W. Aossey; ‘Reading Arabia: British Orientalism in The Age Of Mass Publication 1880-1930’ by Andrew C. Long, reviewed by D.W. Aossey; ‘Talking Through The Door: An Anthology Of Contemporary Middle Eastern American Writing’ edited by Susan Atefat-Peckham with a foreword by Lisa Suhair Majaj, reviewed by Angele Ellis; ‘The Story Of Joseph: A Fourteenth Century Turkish Morality Play’ by Sheyyad Hamza, reviewed by Angele Ellis. FILM, TELEVISION, FICTION, & POETRY: FILM: 'Bastards in Morocco' by Deborah Perkin, reviewed by Lynne Rogers; TELEVISION: ‘Gender Relations in ‘Women's Jail',’ story by Fatheya El-Assal and written by Mariam Naoum, reviewed by Aisha K. Nasser; ‘The Jewish Quarter: Ramadan Drama Revisits 40’s Egyptian-Jewish Relations,’ directed by Mohamed el-Adl, editor’s notebook by Elie Chalala. FICTION: ‘Arabian Tales (Heard with Little Ears) by Hanna Saadah. 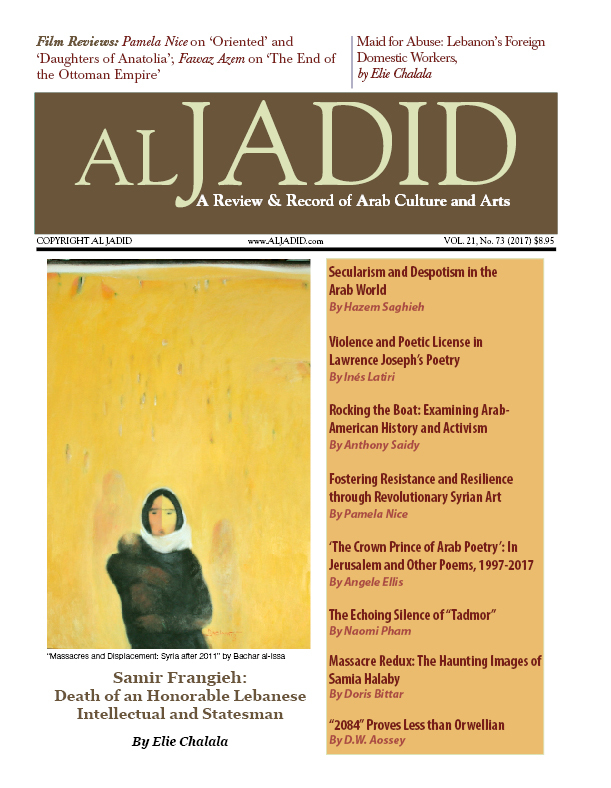 POETRY: ‘The Ordeal of a City,’ by Fawzi Karim; ‘Gaza’s Broken Blessing’ by Lisa Suhair Majaj.